Sir Colin Campbell | Pub Quizzers | Find a pub quiz near you, now. 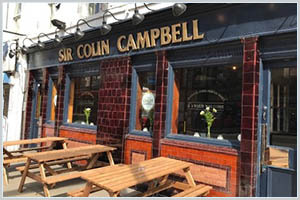 Pub quizzes take place at Sir Colin Campbell, Kilburn on Wednesdays (weekly) at 20:00. Entry is £2.00, you can have up to 6 people on a team. There are prizes of cash, drinks. Happy quizzing! Come join us for our weekly quiz night on Kilburn High Road. All winners qualify for Champions Pub Quiz Night. Follow @CompleatQuiz on Twitter for a clue and a daily question. How many valves does a trumpet have?